Trustable allies on the battlefield are hard to come by. Thanks to our friends from the USSR, we have a good selection of Soviet vehicles to choose from this weekend! These vehicles will be available for sale at a 30-50% discount. The SU-100Y from the USSR is the stuff nightmares are made of. 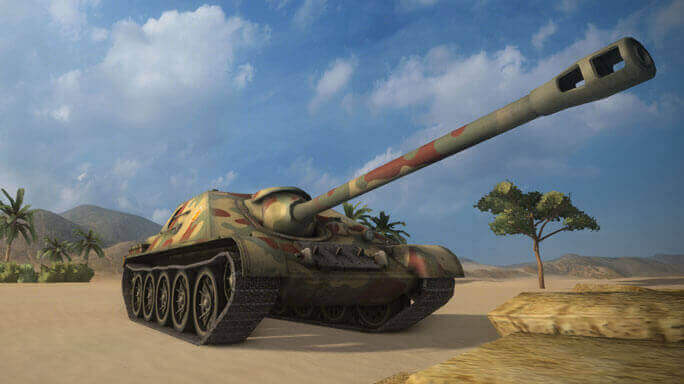 It has a very powerful 130mm gun which is extremely lethal on a tier 6 tank. If there are boss tanks to fight out there, this beast definitely qualifies. It may not be the fastest tier 6 Tank Destroyer, but it is easy to manoeuvre - which is great for tankers who are new to TDs. As for the tank's weakness, be aware of your thin armour as many opponents will be able to down you quickly. The SU-100Y's signal range is not great either, so you will not be able to shoot well across tricky maps. But on the bright side, you won't have to worry too much about being chased by opponents. Fear will drive them away naturally with the exception of worthy opponents or the very foolish. The SU-122-44 from the USSR tech tree puts up a good fight with its deadly DPM. Like most TDs, this tier 7 has very weak armour, but compensates with its ability to deal an insane amount of damage. Experts of hide and seek will love this tank. This tank is definitely a sniper, so make full use of its camouflage potential and have fun killing tanks long before they see you. Its top speed of 47 km/h allows your tank to move to ideal positions fairly quickly, but remember to avoid being detected at all costs. As a Tank Destroyer, a good offence is a good defence. Kill them before they kill you.